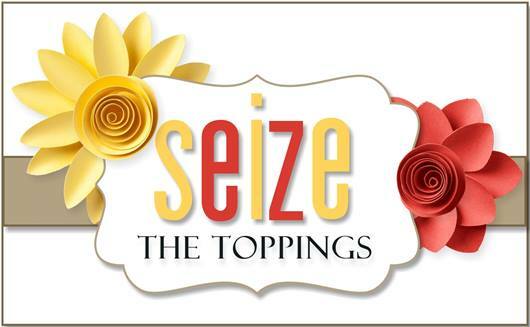 Hello Everyone, We have a fun topping for you this time around over at Seize the Birthday! The topping is something Sweet! Easy and delicious …huh? This card came together rather quickly once I found this great DP in my stash. My cupcake has this awesome sprinkle glitter on it ( it’s one of those things you find in the bottom of your craft box, and it’s amazing, and you know you will never be able to find it again ) it almost looks good enough to eat! I have used many different companies on my card, I tend to do that a lot! Let me know if you have any questions about what is what! You MUST come on over to STB and check out the DT’s cards…They are all fabulous! That’s a wonderful card and a yummy looking cupcake too! Nancy, I just love how you pick your pattern papers and then all the elements on the card look like they’ve come out of a kit – they all go so well together! Love the colors you’ve chosen here and absolutely love that cupcake!! Very pretty. Love the papers, colors, and that yummy looking cupcake. Such a delicious colour combination Nancy! Great combination of elements and I love your cupcake top!